These days it's like you're not a proper mobile device company if you're not involved in wearables, and Huawei's first foray into the market comes in the form of the Talkband B1. The Talkband B1 isn't actually due out until the second half of the year (in Western Europe at least), so its design and features could very well change between now and then, so keep that in mind as you read on. In terms of price Huawei is quoting €99 (around £80, $140, AU$150) which is the current going rate for fitness bands, and quite a bit cheaper than smartwatches such as the Galaxy Gear and Smartwatch 2. Considering the Talkband B1 is a fusion of the two - something Huwei is calling it a "hybrid smartband" - that isn't a bad price point. At first glance you'd be forgiven if you think it looks like a slightly overweight Fitbit Flex, as there are a few similarities between the two devices. First up the strap - and more exactly the locking mechanism is a two pronged metal claps which you squeeze into undersized rubber holes to give the Talkband B1 on your wrist. Just like the Flex. I found this rather difficult to do, as the metal nubs appeared simply too big to actually fit through the flexible rubber holes. Even when not trying to get it on my wrist, I still struggled to pop the pegs through the holes using two hands. Of course the rubber should loosen up after a few wears, but it's still going to be a fight the first few times. Another similarity to the Fitbit Flex is the removable unit, which you can pop out of the rubber strap by pressing the square button next to the device. The core in the Flex is obviously smaller and doesn't have a screen, while the Talkband B1 is more substantial in size and even has a speaker on the rear. Why a speaker you ask? Well to make telephone calls with of course! Yes, as well as showing you the time, tracking your sleep, recording your activity and alerting you of new communications on your mobile, you can also speak to someone using the Talkband B1. I wasn't able to test this out during my time with the Talkband, but I fear for the quality going on the diminutive size of the unit, although Huawei has stuck in two mics to aid noise reduction. While the staps of the TalkBand are nice and flexible - as you'd expect - the top section is very rigid, and it will swamp small wrists, making it look a little odd when being worn. Hauwei has done something clever with USB connectivity here, hiding a USB stick connection under the tip of one of the straps. Plug the Talkband B1 into your computer to charge the device fully in just two hours, and the 90mAh battery should last six days before you have to plug it in again. The 1.4-inch display is handy, although you need to hit the small button on the side of the Talkband to see the time and I did find it was just that little bit too small. I liked the fact that the Talkband supports both iOS and Android devices as it's something we don't really see much of from the smartwatch contingent, and it'll help broaden the appeal of the B1. 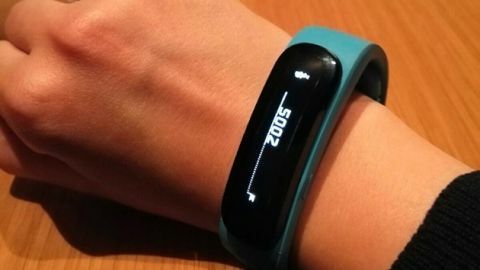 The Huawei Talkband B1 is an interesting proposition and shows once again manufacturers are still unsure what features should go into a smartwatch. I feel Huawei may have got the balance almost right with the Talkband B1, although it may want to have a word with its designers as it isn't the most attractive piece of kit on the market.